The Bowflex SelectTech Dumbbells are a piece of equipment that many have adopted into their home gyms due to their practicality and ability to make your gym more space efficient. Bowflex has created a way to store these dumbbells in a space-friendly way with the Bowflex SelectTech Dumbbell Stand. This product is going to appeal to anyone who owns a set of Bowflex Dumbbells or plans on buying a pair. This review article intends to offer a clear overview of the stand, including features and recommendations. 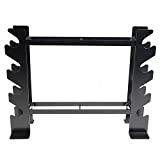 The Bowflex SelectTech Dumbbell Stand is 25 inches tall by 26 inches wide and 26 inches long. The compact design can fit well into most gym setups without taking up excess space. It is also ergonomically designed to allow you to unrack your dumbbells without having to put stress on your lower back. 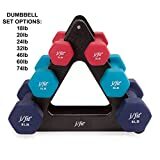 This dumbbell rack works well with any dumbbell set. Moreover, it will be useful for anyone looking to get a good whole body session in with lighter dumbbell work. Users of all skill levels are qualified to use the stand, as it is simply designed and capable of simplifying the storage and usage of your dumbbells in a dumbbell based workout. The stand also includes a media shelf with Teflon material that can hold your phone, tablet, or book while you are performing your workout. 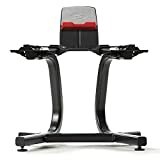 The Bowflex SelectTech Dumbbell Stand is designed for holding your dumbbells in-between sets of moderately weighted whole body fitness routines. We suggest you start your routine off with some lighter shoulder and upper arm movements, before upping the weights and progressing to some compound chest and leg exercises. The Bowflex SelectTech Dumbbell Stand is very low maintenance. Assembly is straightforward and simple. Once the product is put together, there is basically zero routine maintenance that needs to be performed. Nonetheless, if you want it to remain clean and new, you may want to wipe the machine periodically. This way, you get rid of any dust or sweat that may accumulate from repeated usage. There are not many parts with this stand. Therefore, it has little need for replacement parts. If anything were to happen to the frame or media stand, there is a warranty on both of those that is described below. 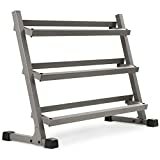 The stand has a 10-year warranty on the frame as well as a 1-year warranty on the media rack. The manufacturer’s warranty cannot be extended, but additional protection plans can be purchased through Bowflex to extend the protection of your product. The stand has a built-in media shelf and towel rack to keep your belongings safe while you exercise. It also has the black buckled straps to keep your dumbbells in place when not using them. The most important accessory is, of course, the dumbbells. Bowflex makes 3 sets of adjustable dumbbells that are designed to work with the SelectTech Dumbbell Stand. Those are the 552, 560, and 1090 dumbbells. Any of these dumbbells would be a great partner to the Bowflex SelectTech Dumbbell Stand. Here is a short list of some important positive and negative aspects of the Bowflex SelectTech Dumbbell Stand. Space Efficient. The stand is perfectly sized to fit into any home gym without taking up excess space. Sturdy Construction. The body is made of sturdy metal, and the media shelf is constructed with Teflon to ensure maximum durability. Ergonomically Sound. 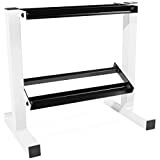 The height of the stand is created to relieve lower back issues associated with bending over to pick up dumbbells from the ground, making the stand a safe preventative measure. Low Maintenance. The stand is easy to assemble, and then requires very little maintenance beyond the occasional wipe down. User Friendly. The built-in media shelf and towel rack allow the convenience of keeping all of your things in one place while you workout. Buckle Straps. The product has buckle straps on the stand to strap the dumbbells in when they are not in use. These can become cumbersome at times when trying to lift. They do serve their purpose of keeping the dumbbells in place when not lifting. Portability. 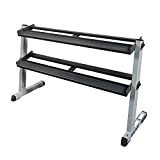 The stand does not come with wheels when originally bought, which can be a hassle if trying to move it from room to room. Fortunately, there are places online where you can buy caster wheels to attach yourself. Be sure to take proper safety precautions when attaching your own wheels. On top of that, check the wheels to be sturdy enough to support the weight of the stand and your dumbbells. User reviews of the stand have given it much praise, as it serves its main purpose very well. Buyers emphasize that the stand relieves a lot of lower back pain associated with dumbbell training and allows for much easier training. They claim the stand is sturdy and able to take whatever wear and tear the user may put it through.However, a couple of issues did seem to arrive when it came to assembly. There were some buyers who either had no instructions as to how to assemble, the wrong parts, or the wrong dimensions on pieces to construct the product. These seemed to be the exception rather than the rule. Still, these are some exclamation marks to be wary of when purchasing the product.Some buyers would have also liked the product to have wheels. However, it turns out that installing your own wheels on the product is certainly a possibility. Overall, the majority of buyers seemed to be content with the product. 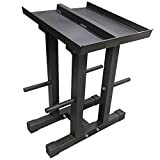 If you are looking for a solid, dependable dumbbell rack, the Bowflex SelectTech Dumbbell Stand appears to be a great option. Although there were some isolated issues with assembly, it seems to be generally pretty user-friendly and space efficient, as well as sturdy. It will definitely help you from throwing your back out while picking up any weights. Moreover, it won’t take up too much room in your home gym. 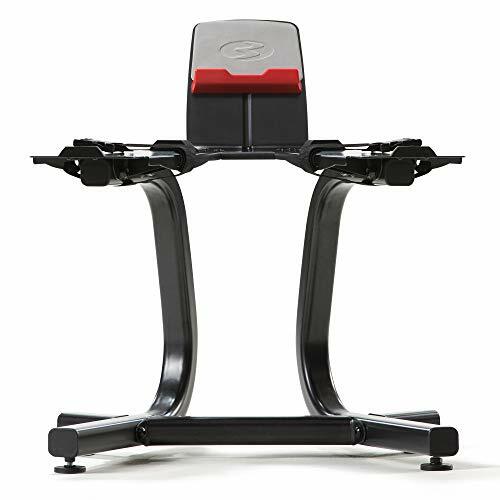 If you are looking to invest in a dumbbell stand, the Bowflex SelectTech Dumbbell Stand seems to be a great option!